One of the best ways to reach people in your market is with Facebook retargeting. We do it for our business and you should be too. Let’s learn about Facebook retargeting now. It works like this: someone interacts with your brand online. That person doesn’t convert immediately and then goes back to surfing cyberspace. Later on, that same individual logs onto Facebook and sees an ad promoting one of your products or services. That’s a reinforcement of your marketing message and it’s going to increase the likelihood of conversion. In fact, stats back up the importance of retargeting. According to a comScore, people who are retargeted are 26% more likely to complete the checkout process. Bottom line: if you skip retargeting, you could be letting a lot of big fish get away. In this article, we’ll go over how to get started with Facebook retargeting so you can maximize your conversions. If you’re serious about retargeting with Facebook, you’re going to have to make use of the Facebook pixel. What’s the Facebook pixel? 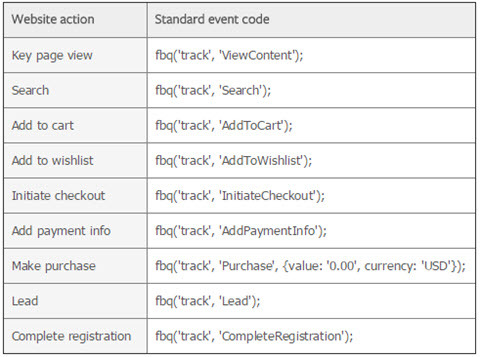 It’s a little snippet of code that tracks actions on your website. Keep in mind, though: it doesn’t just track what people do on your site but who does it. That “who” is the important part because those are the people that you’ll be retargeting. Fortunately, Facebook makes it easy for you to get the pixel. However, you might need to enlist the assistance of a professional developer when it comes to putting it on your website. Give your pixel a name. Make it descriptive and related to your brand. All you’ve done at this point is create a pixel. You haven’t yet put it on your website. To add it to your site, copy the pixel code and paste it into the <head> section of your site. It’s likely that your <head> section is shared by all pages, so putting it there should add it to all pages (which is what you want). Again, though, if you’re unclear about that, get a professional web developer to help you out. Once you’ve placed the pixel on your site, head back to Ads Manager and click “Send Test Traffic” to make sure everything is working. If the status reads “Active,” then you’re good to go. Keep in mind it can take up to 20 minutes for the testing process to complete. Be patient. You also have the option to add event parameters that offer additional info about the event. For example, you might like to set a dollar value on an event if the user makes a purchase. In that case, you’d set the “Conversion Value” field to the value of the sale. You also need to select the currency you’re using to measure the value (for example, “U.S. Dollars”). After you’ve entered all the required detail about the event you want to track, Facebook will give you yet another snippet of code you need to add to your website. In this case, though, you don’t want the code on every page. You just want it on the page(s) that are relevant to the event. As a rule of thumb, if you’re tracking a page load event, you should place the code just below the opening <body> tag. Now that we’ve covered the basics of pixels, events, and how to set up retargeting, let’s look at some retargeting strategies. One of the easiest ways to get the ball rolling on retargeting is to run ads to everybody who’s visited your website recently. To make that happen, fire up Ads Manager and create a new campaign. Select the marketing objective for your campaign (brand awareness, reach, traffic, etc.). When you get to the next page where you specify an audience, you need to create a custom audience. What’s a custom audience? As the name implies, it’s an audience consisting entirely of people you specify as opposed to an audience made of people who share demographics and interests. In this case, your custom audience will include only people who’ve visited your website. Click on “Create New” under “Custom Audiences” and select “Custom Audience.” Click on the “Website Traffic” option. You’ll see a popup that enables you to target all website visitors who’ve visited your site in the past 30 days. You can change the number of days (up to a maximum of 180) if you’re so inclined. Give your audience a name and click the “Create Audience” button. Now, finish creating your campaign just as you normally would. When it goes live, the only people who will see your ad are people who’ve visited your website. Although this method is the easiest way to get started with retargeting, it’s not always the best. Usually, you’ll want to create audiences that are even more targeted. Let’s say you use a blog to portray yourself as an expert in your domain. To that end, you write countless articles highlighting your expertise and rely on content marketing to reel in web traffic. That’s all good, but wouldn’t it be great if you could retarget people who’ve read some of your great content? Even better: how would you like to target people who’ve read specific blog posts so that you can give them a marketing message related to that post? You can do that with Facebook retargeting. Follow the instructions for Strategy #1 above, except when you get to the part where you create your custom audience, click on the drop-down that’s defaulted to “All website visitors.” You’ll see that there are other options. Click on “People who visited specific web pages.” Then, specify the web page (or pages) that you want to include. You can specify a URL that contains certain keywords (for example, “SEO,” “marketing,” “retargeting”) or you can specify an entire URL. Once you’re done, complete your campaign as before and launch it. This time, your ad will only show up to people who’ve visited the web pages you specified in the criteria. This is a great strategy to use when you want to target different segments within your market. It’s also a great way to retarget people who’ve visited your landing page via PPC. While the first two strategies require the use of a pixel, you can use this one without even setting up a pixel. You’ll see a new popup that will give you a variety of engagement options. Select the one that’s relevant to your current campaign. For example, if you want to reach people who’ve interacted with your Facebook page, select “Facebook Page.” On the next popup, specify how you define “interact” with your page (anyone who visited your page, anyone who engaged with a post, etc.). Once you’re done creating your audience, complete the campaign as before. Your ad will only display to people who’ve engaged with your brand on Facebook. This is a great strategy to use to catch the “stragglers.” For example, you can use it to retarget people who started filling out your Lead Ad but didn’t complete the process. You can also use it to target people who started watching one of your videos, but didn’t watch it all the way through. One of the best ways to retarget people on Facebook is with dynamic product ads. If you’re unfamiliar with dynamic product ads, they give you the opportunity to advertise one or more of your products in the Facebook news feed. All you have to do is “tell” Facebook about your products by uploading a catalog. Dynamic product ads are perfect for retargeting window shoppers who visited your site, looked at a product, but didn’t make a purchase. Give those people a second chance to close the sale by gently reminding them on Facebook about your awesome product. To retarget with dynamic product ads, create a custom audience that consists of people who visit a specific product detail page on your e-commerce website. Then, run an ad that highlights that exact same product with compelling ad copy on Facebook. If you’re running a service-oriented website, you can retarget people who’ve signed up for a free trial. To make this strategy happen, create a custom audience that consists of people who’ve signed up for the free trial (you can use the “Thank You” page URL as your filter). Then, create a campaign geared towards that audience. Hopefully, you already understand the importance of upselling and cross-selling when it comes to marketing. You can use retargeting for both purposes. Create a custom audience of people who’ve closed a sale on your site. Then, run ads to that audience offering upsell or cross-sell products. For example, if somebody buys a pair of running shoes on your e-commerce website, why not retarget that person with an ad for athletic socks? If you’re running a service and somebody purchases the least expensive of your three options, run an ad bragging about the benefits of one of the more expensive choices. If you didn’t get enough, check out this video. It covers Facebook retargeting and much more. Don’t let customers get away just because they didn’t convert the first time. Retarget them with ads relevant to how they engaged with your brand. Fortunately, that’s easy to do with Facebook. Just insert your pixel, set up your event, define your audience, and create your campaign. You’ll have people coming back for more in no time.